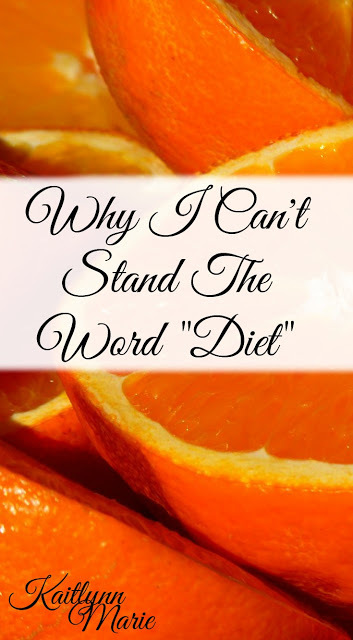 Kaitlynn Marie: Why I Can't Stand The Word "Diet"
Why I Can't Stand The Word "Diet"
The word "diet" annoys me. For a lot of reasons actually. People use it so often; and typically they use its verb form. Meaning, they use the word to say they’re “going on a diet” or “you should go on a diet.” But really, your diet shouldn’t be a temporary thing. You shouldn’t “go on” a diet. Your diet is meant to be an everyday thing for your entire life. That’s why when I talk about my “diet” I mean my eating in general. And when you change your diet, it’s an overall lifestyle change. Not just a fad. Because that’s what “diets” are in the sense that everyone typically uses them. They are “quick fixes” and silly programs with weird names. The only way they really work is if you keep doing them. Which kind of defeats the entire purpose of marketing it as a "quick fix", if you ask me. I mean, just search "diet" on Pinterest and see what you get. We've got a post about losing 20 pounds in 2 weeks "safely." Trust me, that's not normal, and it's almost never safe. There's a 7 day meal plan. Okay, are we repeating this plan every week for the rest of our lives? Sounds boring. And some weird "banana diet." Say what?? Diets are marketed as something that you do occasionally when you fall into a rut. Or if you’ve gained a bit of weight, you go on a “diet” to lose it. But if you aren’t consistently on that diet, you’re just going to gain weight again. You can’t eat McDonald’s or Taco Bell every day for a month, then go on a three-day “cleanse.” It isn’t going to be very effective. You have to consistently eat healthy foods. Obviously you can “cheat” and eat things that aren’t as healthy once in a while. In fact, I encourage it. If you don’t “cheat” once in a while, you’ll binge and make yourself feel awful. But cheat days aren’t going to be a month or two long, they’re called “days” for a reason. Too many people think that going on a short “diet” will fix their problems with weight. It won’t. It’s not magic, it doesn’t work overnight. Most often with diets you lose water weight. Or if you starve yourself as a “diet” you’re going to end up re-gaining the weight when you eat regularly again; maybe not all of it, but enough. Dieting is something that can’t just be a short-term thing. If you don’t plan for the long haul, you won’t get the results you expected. So keep that in mind next time you see a pin or magazine article talking about this new “diet” they want you to try. What is your experience with dieting? Have you noticed what I have or has your experience been different? Let me know in the comments below!